Wedding Anniversary is not only a day to commemorate the union of two soul mates, it has a wider nuances as it marks the beginning of confluence of two communities with amalgamation of two families who have accepted each other and managed ways of staying in a lovely bond. The wedding anniversary is indeed a celebratory moment that is observed with exchanging of Unique Anniversary gifts between the spouses. It has been one of the most longstanding traditions of the world that would never become old. There is very beautiful saying that marriages are made in heaven and found on earth. To mark this milestone moment of life, when you finally met your soul mate, you must plan something totally different. With the evolution of trends and customs, there has been much advancement in the tastes and preferences of people regarding the gifts. The growing excitement connected with wedding anniversary celebrations has impacted in availability of diverse gifting options. In the past few decades, the era of globalization has introduced innumerable options on unique anniversary gifts that are available on Online gifting sites. It is beyond doubt that in today’s bustling life, the wedding anniversary celebrations might take a back seat. Often due to limited time, people are unable to decide on the perfect token of love for their soul mates, even if there is an abundance of choices available to them. No doubt that you need to articulate your feelings in a way that can capture the heart and soul of your dearest life partner. The most apt way to figure out the perfect gift for your life partner is to surf through Online gifting sites that offer huge diversity in the gifting options. It costs nothing to get the best moments of togetherness with your life partner preserved for the rest of your life. With these that personalized photo frames come in various patterns and designs, you can get your best moments printed and decorated in a very modish way. These personalized photo frames can be easily customized with your names engraved on the frame. A photo will be placed in round shape and the background would be printed with small heart shape to give this product a romantic look. The best way to preserve the priced moments is getting them printed on the coffee mugs that you use every day during the light hearted moments. You can personalize them to a further level by getting printed your names as well. This way you can continuously enjoy these happy moments of the married life. The life is after all a beautiful house of lovely moments. Life is not counted by passing of time but by the lovely moments you have spent with your dearest one. A gift like personalized photographic Wall Clock can act as a gift of life. Now you can have a look of you and your darling spouse every now and then. These are some of the unique anniversary gifts that can enliven the mood of your life partner on this Wedding Anniversary of yours. You can combine these gifts with Giftalove flowers and bouquets. 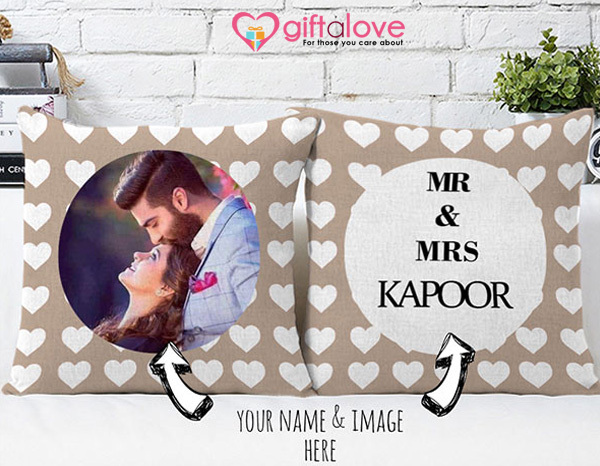 For other exciting options on unique anniversary gifts, visit our website, Giftalove.com, the most trusted e-gifting portal through which you can convey your love to your dear ones through valuable gifts online to various cities including Delhi, Mumbai, Chennai, Bangalore, Pune, Kolkata etc.